A NEW route from France to the UK has opened up, with tickets starting at just £1.50 each way. The potential downside? It takes at least 10 hours, and most of that time is spent on a bus. As a very frequent traveller between Paris and London, I decided to test out Megabus’s new coach service in its launch week, in April, out of curiosity – but also because of the lack of other feasible options. With the exception of rival Eurolines, if you need to make a short-notice dash back to the UK and are reliant on public transport, the other providers can be prohibitively expensive. While Eurostar and the budget airlines reward advance booking with cheap tickets, seven days before my chosen date of travel, the cheapest available Eurostar was €148 out, and €77.50 back – a total of €225.50. On the night before travel, the outbound ticket had risen to €245. EasyJet’s lowest-priced option from Charles de Gaulle to Luton worked out at €140 return, but with the added RER ticket to the airport and train to London at the other end, it would have added up to €185. The shortage of inexpensive tickets could become even more of a problem this summer, when tens of thousands of people will flock to London for the Olympic Games. ticket cost £10.50 – prices range from £1.50 to £40 depending on demand. Online booking is currently only available in English and in pounds, but a French version (in euros) is due to launch next month. It is 22.00 and a small group of us are standing in the middle of a dimly lit coach park near Porte Maillot, on the western edge of Paris. There are no signs, no obvious guidance what to do, but we head over to the big blue righthand-drive bus and the staff are friendly (as a British company they all speak English and at least one of them speaks French). It takes an hour for the 42 of us to board, as our names, nationalities, dates of birth and passport numbers are logged meticulously, one at a time, by a man with a laptop computer sitting on the front passenger seat. We set off at 23.20, a bit late, and the driver greets us with a “good evening, good morning and maybe good afternoon too”. It sounds like we are in for a long journey. While most of us have London as our final destination, one passenger in her early twenties says she will be changing in the capital to go all the way to Plymouth. Another, who is on an Erasmus placement at a Paris university, is visiting her brother for the week in Liverpool. There are couples of varying ages and two families with teenage children onboard – it is far from being a route used only by students and backpackers. Our bus is modern and the seats are relatively comfortable – reclining ever so slightly, for those who choose to sleep (everyone, except the driver). Leg room was adequate, and luggage space plentiful – although there seemed to be a lot of litter hanging around from a previous trip. The toilets were clean and the wi-fi internet access not bad at all. Most of the passengers nodded off quickly, not noticing that the first hour of the journey was spent getting lost.We took the A14 motorway out towards Normandy, only to find it closed, prompting the driver to stop briefly in an industrial estate to reset his sat nav, drive back to Paris and try another route. We make it to Boulogne in just enough time to avoid a compulsory 45-minute rest break that drivers must take after four-and-a-half hours on the road. It is possible to join the bus here if that is more convenient than Paris, and you do not mind waiting at a bus stop in the town centre in the middle of the night. Our replacement driver takes us to Calais, where everyone is woken up at 3.45 French time for UK border agency checks. This took an hour – the passenger manifest that someone spent all that time compiling in the coach park back in Paris had gone missing and one man had to alight because of immigration complications. Another fellow passenger is anxious. He has a job interview in London at 9.45. If we arrive on time, he has an hour and a half to freshen up and prepare, but that is looking unlikely. However, by 5.15 French time we were on a choppy P&O ferry setting sail for Dover. This was a welcome change – some Eurolines services take the Eurotunnel instead. On the ship, passengers can more easily stretch their legs, enjoy breakfast or catch an hour’s sleep on one of the sofas. With stop-start rush-hour traffic on the A2, we make it to London’s Victoria coach station just 45 minutes behind schedule, at 8.15. With the ferry break in the middle, and some short bursts of sleep, the time has passed surprisingly fast and, despite a few teething problems, I would definitely consider it again. 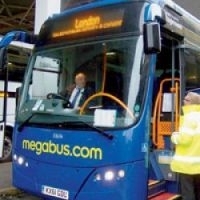 Megabus provide onward travel to about 25 UK destinations. They also offer discount coach travel from Paris to Brussels and Amsterdam. Asked about serving other French destinations, he said it was something that the company was “monitoring” – either UK-France links or domestic services between French towns.